It's an experimental Bull-Pup conversion from YUGOIMPORT of Yugoslavia. 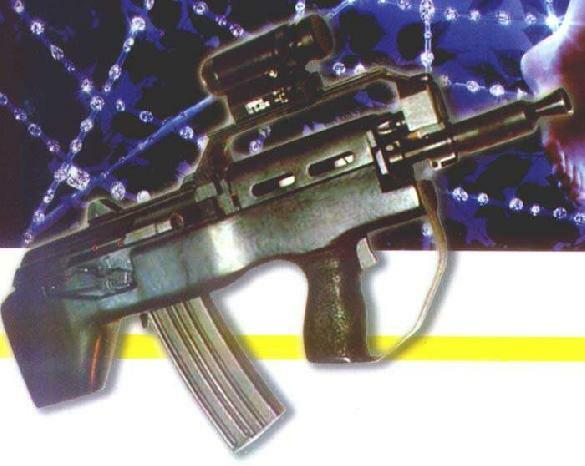 Basically it's a Bull-Pup plastic shell for the .5'56x45mm or .7'62x39mm Yugoslavian ZASTAVA M85 assault carbine, and for its Iraqi copy, the TABUQ-SHORT. I don't think this design will go pretty much far away on the market, though. The M85 carbines are pretty short by themselves, the Bull-Pup conversion makes them even shorter, maybe Yugo and Iraqi Spec-Ops units and Combat-SAR teams or tanks and air crews may want one for PDW purposes, but...?